To install Poetry you can simply use pip install -U poetry, this will install the latest version on your system. You might have to do a --user install if you're using the Python distribution that is pre-installed on your machine. Now that we have our project and Poetry is installed, let's get to it. First, you need to create the project's pyproject.toml file at the root of your project. This file contains metadata about your project and all dependencies it might have. To create this file simply run poetry init from the root of the project and follow the prompts, values between square brackets are defaults. click will be added to the pyproject.toml and Poetry will update the pyproject.lock file. Note that adding a package will create your project's virtual environment but if at any time you want to install your venv manually you can do so with poetry install which will install your dependencies into the project's venv. install will not however install your own project in the environment, to do this you need to use poetry develop, which does all of what install does but also symlinks your project in the venv. Poetry also supports defining "dev" dependencies, those are libraries that will need to develop and test, but that are not required to run your app. You can add those dependencies with poetry add --dev <library>. Usually, you will find flake8, pytest and other tools in this section. So, now that we have our code and Poetry-managed virtual environment ready we can run it. Poetry provides two useful commands for this scenario, they are poetry run and poetry shell. run will run a given command from inside the Poetry venv. 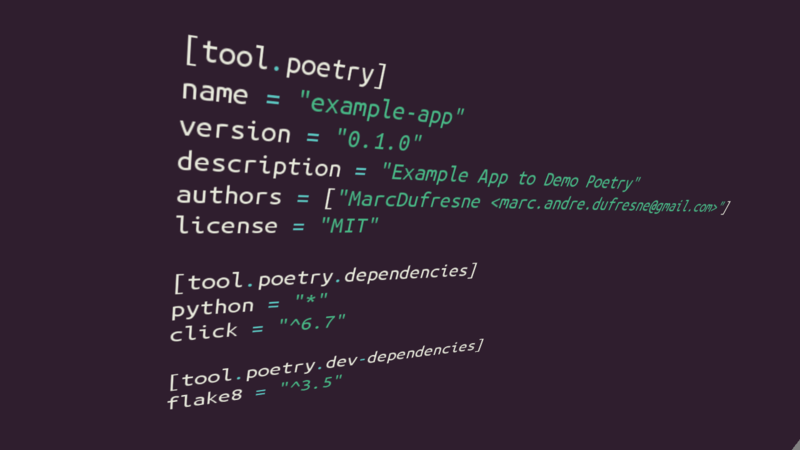 So if we wanted to run our app we could do poetry run python example_app/app.py. shell mimics the behaviour of activating a venv. This allows you to run commands from inside the venv without using poetry run all the time. And finally, one great reason to be using Poetry is that it can build and publish your library or app if you need it to. Simply use poetry build and poetry publish, or poetry publish --build to do both at the same time! You will be prompted to enter your PyPI credentials when publishing, and once you do that your package will upload to PyPI. Publishing is completely configurable so you don't have to enter your username and password all the time. And it can even publish to other repos, even private ones. Bonus: Poetry can show you the outdated dependencies in your project if you do poetry show --outdated or a dependency graph if you do poetry show --tree. For more information consult the official Poetry documentation.